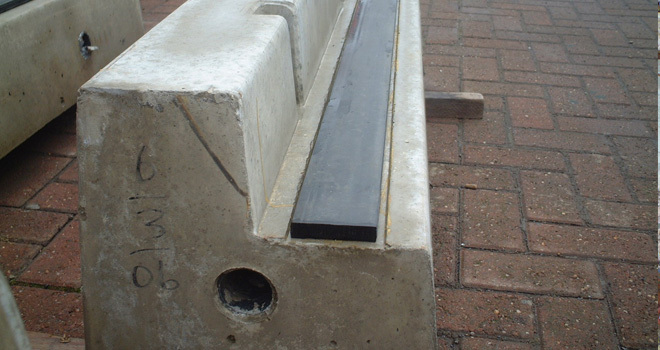 Also known as edge beams, cill beams, Bomac kerbs or edge kerbs, these are reinforced concrete kerbs used to support the cess, 6 foot or outer panels for both Polysafe and Bomac level crossings. The type of concrete used by Polysafe ensures a long life for these items, meaning little (if any) maintenance over many years. They have been used successfully on level crossings for 30 years, for both new projects and maintenance. 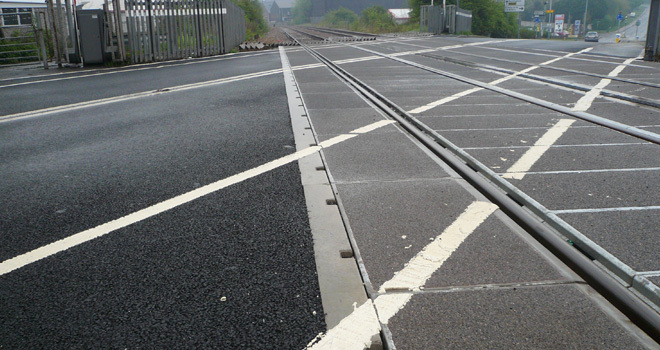 They have also been used to support rubber level crossings where their own edge angle has needed replacing, meaning they are then in place for a Polysafe level crossing deck. They are available in different lengths so that in combination they suit the width of the level crossing. They come complete with an attached rubber supporting strip meaning they are ready for installation upon arrival at site. Polysafe also supply kerb lifting devices / chains to ensure safe lifting and minimal installation times.